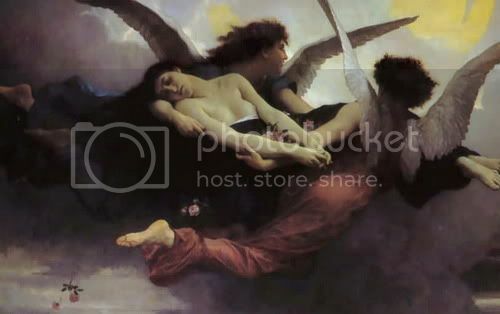 ~ ‘A Soul Carried to Heaven’, by William-Adolphe Bouguereau, 19th cent., cropped. I will be gone away from July 1 until July 12. It’s time for my annual summer visit to see my dear old mum (and my brother and his wife, who live in her area). My brother plans to take us all on his new boat to watch the fireworks from the Potomac River. Hopefully it won’t be rained out. That part of the country has been pretty sodden lately, and the forecast isn’t that hopeful. My husband and daughter will return home on the 6th, but I’ll be staying on to take my mother to some of her favourite jaunts (the grocery store, out to lunch, the library, little stores, doctor appointments), one little outing a day, which is all she can handle comfortably. My mother was widowed 13 years ago, and lives alone. She still is able to drive, but the traffic there, which became intense decades ago, is really too much for her. So, she is relatively house-bound. She manages better than one would expect at nearly 83, especially after her small stroke last year, but the result of her getting out so little is that she has become very lonely. She had had a cat, a lovely and devoted pet-friend, but it died of cancer (at a youngish age) two years ago. My mother won’t get another, because she doesn’t want to die and leave it not properly looked after. Besides, she knows she would no longer be able to manage a litter box or take it to the vet’s. My brother comes to see her every week, makes sure her house is kept up, and sees to most of her paper work. An angel of a next-door neighbour comes over every afternoon that he is there, to have a drink with her for half an hour; she talks his ear off, he makes her laugh and feel like a woman again; her combination son, servant, and gentleman caller. He brings her morning paper to the door, takes her trash cans to the curb and shovels her walks when it snows. He and his wife have taken her to the emergency room several times, and come over to sit with her when she's had a bad night. But most of her friends and neighbours have died or moved away. The last remaining members of her own family are two sisters-in-law who live in England (she was a WWII war bride). My mother is the last sibling of six. Since 2000, my husband and I have been asking her to come and live with us, but she won’t come. She hates cold weather and being stuck in the house, and this is Bad-Weather and Stuck-in-the-House central. I think the thought of dissolving her possessions and selling the house is terribly daunting, too (although we children could see to most of it for her). It’s a three-bedroom, two-story house, in which she has lived for forty years. It's neat and clean, but every closet, every bureau is filled with stuff. Much of it is new purchases: clothes and shoes with the price tags on them, gift items “just in case” for weddings or showers that she no longer is invited to, since she always declines. Table cloths and sheets still in the packaging. Her cabinets are filled with food goods she will probably never open, much less eat. A Depression-era child, she lived through rationing during the war (she’s from England’s Midlands), and never seems to have got over the feeling that she wouldn't have enough. It would be a severe trial for her to see all of this given or thrown away, or sold for next to nothing. Well, eventually she will not be able to live there by herself, and she will be forced to come to us. It would be that or the nursing home. She would rather be euthanized than go into a nursing home, as she tearfully reminds me when we speak of the time when she will have to move. (Unlike the nursing homes up here, the ones down there are mostly residences of mutual strangers, staffed by people who often speak little or unintelligible English -- unintelligible to my mother, that is -- her hearing, even assisted, is quite bad).) Her fervent wish is that she’ll just drop dead or not wake up one day, at home. I know from your LJ’s that many of you are seeing aging parents through their old age and dying. Some of you are coping with their deaths and finding it difficult, whether your relationships were loving and amicable or shadowed by bad feelings. You know the sorrows and burdens – and sweetness of it. How quickly it has gone, especially when I think how tiresome the passing of time seemed when I was young. My mother always said, “One day you will turn around and wonder, Where have all the years gone? She was right. I often think of these sayings of hers as I see the children growing up and going off to live their own adult lives. Well, I suppose I should wash the clothes and do some packing. I shall miss you all, and I shall miss writing. My mother has no internet and her computer has no printer. It is too old to be fitted for a flash thingy for memory. I can use the internet at the library, but just for half an hour a day, when it’s open. In that way, I hope to “stop by” your LJ’s, and answer any comments, but I won’t be much. P.S. Our daughter dragged me to see Superman Returns last night. It was really very good. And it worked for me. Perhaps, “flying together” is what is at the heart of sexual intimacy, the thing so many of us seem to yearn for. It doesn’t really matter how it is achieved. I loved a moment in the film when Superman appeared to Lois one night, sneaking a forbidden cigarette on the terrace of her family's penthouse. He just hovered there, in the air, reminding me as much of Peter Pan appearing to Wendy as of Eros. It sounds silly, but I thought it was charming and lovely. But the flying scenes were the best, including the ones when Superman would be flying by himself -- just "chilling", I guess. And, yes, hopeless fan that I am, I kept picturing Frodo flying about the night sky in those shots, gliding and dipping through the stars, or, in the sun above the clouds, rolling like a dolphin under its rays, luxuriating in a sea of light, as he soared between the Circles of the World; beautiful, wild, and utterly ecstatic. 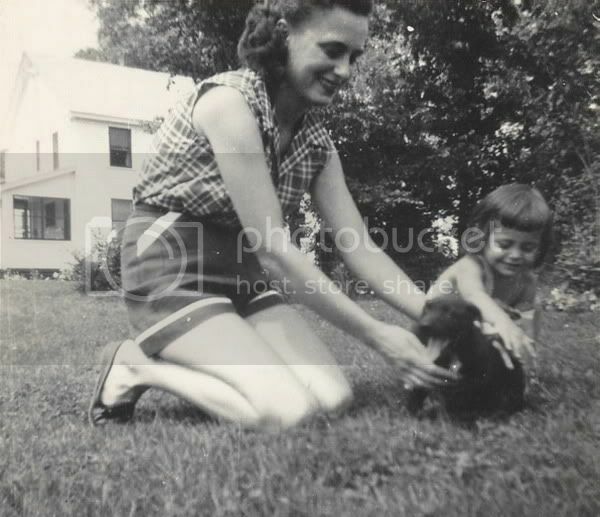 Below: me and my mum in 1953, in Williamstown, Massachussetts. I was 2; she would have been 30 – twenty-five years younger than I am now. Shees! My mum lives with me and has since 2001. She is 82 and I am one year older than you. Boy, can I identify. I am very glad she is with me now, but I just spent 10 days with her back in her old stomping grounds. Letting her visit her relatives and friends while I pushed the wheelchair and acted as chauffer. I think she is healthier for it, but undeniably, she misses her old hometown. It is a struggle, but we compromise together. And yes, the years fly by. Half of this one is gone already! Just thought I would let you know that I am right there with you on this one. Thank you for stopping by, Elanorgardner! That encourages me, to know that your mom is living with you and that it is working out. Your mother is lucky to have you, and she probably knows it. I know my own mother will miss her own place, if only because it was her place, rather than living in our home with just her own room to call hers. But she really is living a terribly isolated life, now. She is not involved in anything in the community (and never has been), so it is not as though she would miss any of that. She would miss my brother, though, and he would miss her. They are very good friends and fond companions. But his marriage is not one that could bear a third party living with them. Too bad. They have a HUGE house, and so near by. But she rarely goes anywhere, anyway, and hates sitting outside. I don't see how it would be so onerous to come and sit inside all day, here, instead. We have pretty views, lovely, affectionate cats (3), and nice humans, as well. My husband's very gregarious elderly parents live only 25 miles away, and my mother likes them very much, from the few times they've met. They could visit. But there is no denying that it gets horribly cold here. An arthritic person suffers, even in those brief trips from house to car to destination. And getting an elderly person (much less a wheelchair) over frozen, uneven sidewalks and parking lots is not easy. Still, I think she'd much prefer it, once she were here. What a thoughtful, loving post, Mechtild. My mom is 75 and my dad is 78, and we do tend to think, more and more frequently, "How much time is left, and how do we make the most of it?" My dad lives 3000 miles away, but he's still able to visit me every Thanksgiving. I keep my mom close (in the same apartment complex! ), but one can see the signs of slowing and fragility creeping up. We truly have to seize the day, and the loved ones, for as long as we can. Safe trip, good weather, and hugs to you. Shirebound, you are sweet. How lucky that you and your mom live so close! Yes, "seize the day." My daughter was sluggish writing her thank you cards for her graduation gifts, many of which are from very elderly relatives. She thought I was joking but I wasn't when I said, "Don't wait, write those now. You don't want your thank you to arrive after they've died." You just never know. 3,000 miles away! Now, that IS "far"!!! How good that you still manage to see each other regularly. You lost your long-time home? That must have been difficult, Mews. Especially if you had to give up a lot of things you'd been saving or "collecting" for a long time. When I look at my mother's situation, or at my sister's (sure to lose her beloved house after her husband left her; it will need to be sold to split the assets), both of them loving their houses and having filled them with loads and loads of stuff they love of were keeping "just in case", my husband and I decided we would pare back. I haven't really done much about it yet, but we plan to start going through what we have (not nearly as much as my sister and mother, but far more than we need), and giving it away or selling it. We are older parents of an only child. Neither of us want to make our old age and dying an extra burden for our daughter, since she will have to handle it all by herself, when the time comes. We want to make it easier for her. And the cutting back will make life easier for us, too. I think the possessions; even this house; are becoming more and more of a distraction. I learned that things really don't matter much, when my husband died. People are all that really matter. Loving each other and making the most of the time you have together. I hope your visit goes well, and I wish you a safe journey. My mom will turn 81 this October, and it was only last year that she retired from a full-time job as an executive secretary. Unfortunately, she's slowed down a lot due to back and leg problems and doesn't get out as much as she'd like. She's frequently depressed with little or nothing to do. I bought her a computer so that at least she could get on the net and "get out in the world", but as much as she was intiially enthused with it, she still hasn't gotten herself an ISP. So what to do? I'm 45 -- my parents had me after 12 years of marriage, and both were considerably older than the parents of my friends as I was growing up. I'm an only child and now live 2 hrs from Mom (I'm single). Add to it that we have no family, only each other. Luckily, she does have friends and there are neighbors in her apartment building who'll look in on her, and I can only do so much myself. I have to have my own life -- not easily won from her, I might add -- and fear getting subsumed. But I know it will come to that some day. I just don't look forward to it. Read my response above to Mews regarding leaving an only child burdened. You are right to be protective of your own space. My older sister has finally won some space for herself, just beginning to come out from the gloom of an unwanted divorce (it's been three years since he left). She has a big house with nobody else living in it, in a place with a nice, mild climate. It seems like the logical solution. But the fact is, they could not possibly live together. Even though they love one another, they don't get along. My mother would drive my sister crazy, making her angry and irritable. My mother would become resentful and sullen. They would both be miserable. Having a parent come live with you is something every person has to think about, in terms of whether it really would be for the best. Sometimes it would not. Your own mom sounds as though she is a woman of personal resources, compared to many her age. I draws well on the social contacts she has apart from you. That's very encouraging. Your mother looks like my grandmother. She's the last sibling of six, too, and her brothers and sister are dead. My grandfather died 9 years ago, and she misses him, even if they spent 55 years quarreling! And she keeps in stock a lot of things, exactly as your mom does. And as your mom, she's afraid of the nursing home, and would like to die in her sleep, peacefully. I understand them: for me, nursing home are hell; I hate these places, even if I know they are very useful sometimes. My grandfather died 9 years ago, and she misses him, even if they spent 55 years quarreling! Ha! Mine, too, except it was for 47 years. How they fought! But, in the end, they seem really to have loved each other, and only each other. You are very brave to offer your mom to live with you. I know I could not live with my grandmother, and I know my own mother, who is 63, would prefer emigrate to North Pole than share her (very small) apartment with her mother. See my response to Aquila, above. I would not offer if I didn't believe we could get along. I think we can. My sister and my mother? No way. That's funny! Mine is actually pretty good-tempered, but she is very prejudiced and never keeps her opinions to herself, even when she knows her listener hates or is hurt hearing her declarations. This is the main reason my sister would hate her living with them. "What if she goes on her anti-liberal, racist, xenophobic rants? Or nags me about why my children aren't better off, not married, living in sin, etc.? How will I bear it? I'm not changing my life around for her! What if she insults our [grown] children's gay friends when they are over?" "Well," I said, "you will have to speak to her. Other than that, I think your friends will realise she's a narrow-minded, opinionated old BAT on certain issues. I don't think they'll take her slights to heart. Surely, they will have met other sexist, racist, narrow-minded old bats by then." I can laugh, my sister can't, I am afraid. No, she could not live with my sister. (((Mechtild))) I'll be missing you while you're off the net. Looking forward to your return. Goodbye for now. Safe journey there and back again. Give my regards to your mother too, if you'd care to - I was sending good vibes her way as I read your post. She's lucky to have you, even if you do live so far off. Thank you for the informative post you took time to enter in my LJ in the middle of packing and worrying over your mum. And rest assured I'd never remove *you* from the flist - of course not! Sheesh. I hope you didn't really think that? And rest assured I'd never remove *you* from the flist - of course not! Sheesh. I hope you didn't really think that? Maeglian, I think it is too cool that you are thinking of this trip. If you firm up your plans, and I see that you are going to areas I have been, I'll open my maps and see if I have any further advice. There are just so many great places to see in the world. Ours are awfully spread out, though. Most inconvenient! Oh, Mectild, do you know, I've just been talking to my mum on the phone just before I read your post. She's returned from staying with my Nan for two days. My Nan is on her own now and terribly lonely, having just recently lost my Grandad, but she's trying so hard to make a new life somehow out of what is left - although, as she told me, it's so hard if you've always had someone to care for and suddenly you have to find another reason for being. Although my Mum's offered, she doesn't want to leave her home and move in, she's still got ties that hold her there and, fortunately, good neighbours and friends. This doesn't stop my Mum feeling worried and guilty though, whenever she leaves and my Nan still feels lonely, but they are managing as best they can. It's such a hard situation. Igraine, how neat that you were just talking about this same subject. Your mom and I will both continue to feel concerned and a bit guilty with our mothers living alone. They want to, which means we have to live with in the tension between the two things: letting them live alone and watching them feel unhappy without being able to do anything about it. My mom is from Stoke-on-Trent in Staffordshire. Igraine, you are going to have to stop by a cinema and see Superman Returns. For an action film, it has a lot of solid human plot in it, especially between Superman and Lois (both very well played, especially Kate Bosworth in dark hair). I thought about Frodo's story very often, of course, all that "lonely hero sacrifices self for the sake of others" stuff running through it, not to mention those solo flights through the clouds, under the sun and stars, which take my imagination with them. These are literally scenes of Superman flying, but, just as the Inuits have lots of words for snow, this film does a lot with his flying, showing various moods and reasons for oing it. He not only does lots of the usual, purposeful, "I've got to get there and save the day!" sorts of flying; he does flying that is contemplative, melancholy, dreamy, ecstatic, sheerly pleasureable, and, of course the flying with Lois, which also is done in a subtle palette of moods. I just adored every single flying scene of these unusual types. They were great visual metaphors for states of the mind and spirit. There. Now when you see it you're going to be all disappointed and think, "Mech's been abusing substances again." That painting is a keeper, isn't it? If you would like to see the full painting (it's not that much bigger), I'll email it to you. Here is 9.30 pm, I just put my mom to bed with the usual ritual as a child. If you like, please, tell your mom that an Italian, with the right age to be her daughter, greets her, wishes her happiness and she is in her prayers. I'll tell her that, Estelanui. And a kiss for you mother, too. How sweetly you care for her. P.S. I just printed out your review of the O'Neill book on Tolkien and Jung. I'll be taking it with me. I also got a message that the book came in from our "inter-library loan" service. I'll be able to take it with me! Have a good time, dear - it sounds as if you have a good relationship to your mum, and I like the thought that you help her with all those daily matters that are so "normal" for those of us who have no problems to get to whereever they want. My own mum is 73 years now (I'm 43), and we mostly get along very well. But she lives 400 km away (I'm sure the distance is very helpful...*weak grin*) and is still healthy and agile. Right now she is in Italy, visiting Lake Garda together with a "travel friend" and hopefully enjoying herself. Oh - and I like that beautiful s/w-picture! Thanks, Mona. Your mom sounds as though she is in great shape. I hope she'll keep her health for a long time. Some people are healthy for the length of their years; they just die in their sleep one day. That's what everyone wishes for their parents, of course. 400 km is about 250 miles. Out here, that would be like driving to the next state. With unclogged roads and fast speed limits. It would only take 5 hours to drive there, tops. Where my mother lives, it might take two days! The traffic up and down the East coast between the major cities is just terrible. I have been to the Lakes district, years ago. It was GORGEOUS. Oh yes, darling Mechtild, I do know about parents growing old, and about worrying about them. I'm 52 going on 53 and both my parents are still alive, but getting so old and frail that it's getting harder and harder for them to fend for themselves. I do whatever I can of course (I do have a fulltime job though, so my good isn't really good enough), but what they really need and want is to go into sheltered living. Yet you wouldn't believe the length of the waiting list. I hope you'll have a safe trip and a good stay, darling Mechtild. And such a lovely picture- thank you for sharing! Hi, Hobbitlove, it's good to see you. My mother would do a lot better in assisted living, too. But she won't go there, either. She just has dug in her heels. She wants to stay in her house. That's fine, if she gets her wish: to just die there one day. You get assisted living on the National Health? That's a great thing - but if the waiting list is very long, one worries that by the time a spot is open, it will be too late. I feel for you, trying to make a living and live your life while having to keep an eye out for your parents. We worry that we will leave our daughter in that position. We were 35 and 37 when she was born. When she is my age, if I still were alive, I'd be 92! Poor kid. Maybe we'll have to go sit on an ice flow! Have a save trip and enjoy your stay, Mechtild! Take care, you two ladies! Wow, that was very young. I have other people on my f-list who lost one or both of their parents when they were young. What a lot of years you missed. If you got on well with your mom, all the more are those missed years. I found that our relationship has improved not deteriorated over time. Thanks for the bon voyage, Whiteling! My sister was the one who took my father in when he got too old to cope. Something I probably wouldn't have done as I had some serious issues.. so I am grateful that she did. It couldn't have been easy on her as he was a very sweet and gentle man normally but when drunk turned into the devil. Still, she loved him and I didn't (at least consciously. There is always a child inside who loves parents unconditionally.. )so I guess it worked out for the best really. I certainly understand the problem of 'stuff' It does collect over time in an AMAZING way doesn't it? I am so unwise in my acquisitions too.. we have to move often and right now I have TONS of things that I will have to find homes for.. (Corral panels.. a potters wheel that weighs so much you can't even shift it...) All must go and I am working on lightening the load as it all gets heavier and heavier as we grow older. Just the books could kill us both now. Still, I keep repeating the mantra. "One who can not cast a treasure away at need is in fetters" Boy is that true or what? I need a metal file! That next door neighbor that your mother has.. How wonderful he is!! He really IS an angel! I think that your mother though will be happy after an adjustment period really.. if she ends up moving in with you. It sounds like her life won't change too much really and you can bundle her up when she goes outside. YOU WERE ADORABLE with your mama and happy, little puppy!!! Have a wonderful and safe time and hurry back, my friend. Your mom would have been 92? I just said above that I will be 92 when our daughter is as old as I am now, should I live that long. I really don't want to be a big burden on her, nor does my husband. She'll have all the responsibility, since she's an only child. I hope we die before that. It was great that your sister had the gifts and temperament to care for your father. That is what I feel is my role in our family; my sister and my mother just would not get on; my brother's fragile marriage would not bear the strain of another person. It has to be me. Which is fortunate, since I think I also am the most amenable to it. So you are a hoarder? Well, I have loads of stuff, too, little bits of this and that saved, "just in case" I'm going to do a project or "just in case" the children next door need some bits of things for crafts. But it's all just sitting there. I really should get rid of at least half of the stuff we own. Growing up, as military kids, we had to get rid of our extra stuff all the time. Every week, "closet inspection." Every month, "toy box inspection." (My dad was the inspector.) If we hadn't been using it recently, out it went. This made the inevitable move easier, since a family was only allowed to ship so-many-pounds of belongings. A few years before my dad retired at 55 (my age!!!! ), they bought the house my mother still lives in. From that time on, my mother made up for all those years of having to keep throwing things out or giving it away, LOL. I hope you have a wonderful trip. I'm sure your Mum is looking forward to your visit. My Mum (there's the number 92 again!) is still living at the Hostel. You may remember that we were worried back in November that she would soon have to move into the Nursing Home. I'm really impressed at how well the staff are looking after her at the Hostel. She's already receiving high-level care in their low-level facility. They said she would continue to stay there until such time that her safety and well-being became too difficult to ensure. One of their main concerns had been that she'd get disoriented when she gets up in the night to use the facilities which are across the hall from her room. (No staff are on duty at night in the Hostel - a nurse from the Nursing Home will do a "round" during the night to check that all is well, and each resident has a Nurse call button at their bedside.) It seems that she's taken to using a commode in her room now, so that concern has been reduced. When Mum moved out of her home, we found new sheets and towels, and things suitable for gifts all put away for a time when they'd be needed. Do you think we're hoarders? Not only do we have our own "stuff", we have some of my Mum's "stuff" and my mother-in-law's "stuff" as well! There are too many things that are too good to get rid of (even though we'll never use them). I think we need more descendants, so that we can have someone to pass it all on to! My mother-in-law was showing me a dozen unmatched china cups and saucers she had been collecting over the years. Would I like to have them? I said, no, finally. We just have so much stuff, and here I am trying to get rid of it. If we ended up with his parent's stuff, and they are not packrats or rich, where would we put it all? His brother has a very tiny place, although he could use some of it. My mother has enough kitchen stuff stashed all over to fit up three kitchens. My sister and brother would not want her stuff; they have gobs of the expensive stuff. If we didn't already own all the sorts of things she has, we'd be happy to have it. I am thinking that rather than toss or give away a lot of it, we could give away our stuff (except the things I truly prefer) and take hers, so that I could keep it in the family somehow. Too bad Rachel wants to live in Hawaii. One of the reasons I have hung onto so many of our own things is so that she could have them to fit up her first apartment. It was a huge boon for us to receive my parents cast-offs, years ago, when we had our first place. But we are certainly not going to pay the shipping to send all this stuff there. Well, maybe she'll change her mind and live in the mainland U.S. Then she could drive it all. There's enough so that she wouldn't have to buy a thing, really. My sister's kid might want some of 'Grandma's stuff, but they live so far away (California), I can't imagine them driving a U-haul to come and get it. But, who knows? I am pleased to hear your mom is still where she is. Putting a comode in her room is a great idea. Getting lost in dark halls at night looking for the toilet is something I did for years as a small child (my parents didn't believe in night lights, silly things). Time certainly does fly as we get older. Funnily enough I was watching Superman II last night and bemoaning the loss of Christopher Reeve. :( But as my daughter said- we'll always have the films to remind us how he was in his prime. Memories are precious things when we get older. I didnt understand why old people were so nostalgic when I was young, but now I do. My parents are in their early seventies and in good health and very involved in social groups and activities where they live( about 15 miles away from me ). I dont like to think about them becoming frail and unable to care for themselves. My mum has mentioned sheltered living as her preferred option if the time comes. My in-laws are not in good health but are very proud of their independance and even refuse offers of help with essential house repairs, though they wont get anyone else to do the work either. They dont want their routine to be disrupted. My sister-in-law has just moved back in to care for them so hopefully she can pursuade them otherwise. Hi, Quicksilver! Your parents sound very chipper; and how great that they are so close. It has been a burden to drop everything and pay for airfares and get time off to spend weeks at a time caring for my mother (between me and my sister, both of us 1000 and 2000 miles away) when she has been ill or injured. My parents-in-law are pretty healthy, but, like yours, they don't like receiving help. My husband helps them around the yard since his dad is so picky about the job the hired teenager does (my husband works in the same town his parents live in, about 25 miles from here), but they are still always trying to help us, rather than the other way around. My mother, I am afraid, is a bit spoiled, LOL. She is very generous to us every Christmas with money, as they were when my dad was alive. But they never have given of their time taking care of the children of any of us, or offering to do so. It's funny that we have ended up taking care of them so much. My dad required frequent trips for years and years because he had such bad heatlth. But my mother has been a bit of a baby, but she loves it. I think she spent so many years as someone's servant (her parents' and then her husband's), she simply has been luxuriating in being taken care of. Certainly not the plucky "I'll do it myself!" Brit we had thought her years ago. Also, I think it just repeats the way her own family dynamic worked. She was the youngest in a big Staffs. family that all were put to work in the pottery factories as soon as they were old enough to legally leave school. It didn't matter if they showed promise in school, her parents wanted the income. They took the majority of the wages as long as the child resided at home. No wonder they all married young! My mother was no exception. She was turning over her wages until she left her parents' house to go with my father to the United States. I don't think her parents would be considered especially mean or self-serving for their place and era, but it's very different from, say, a Jewish immigrant family in New York a hundred years ago, where the parents scrimped and the younger children worked to help pay for the eldest, each in turn, so that the children could have better chances in life then their parents had had. My father's family were immigrants from Armenia; there was a similar push, once they were in "the new land," to see their children rise above the lot of their parents. I took a course once in American social history, and it seemed not that uncommon for families to operate the way my mother's did - the parents had children because a) they just did and b) they were useful. If they lived on farms, the children became the farm crew. If they lived in towns, the children went to work and contributed to the income. Children who wanted to go on to further education or leave were considered uppity, ungrateful and "above themselves." I suppose they brought this attitude over with them, from the societies in which they grew up. It wasn't limited to just my mother's family, is what I want to say. So if my mom doesn't think twice about us caring for her, even expecting it, it's not that different from her own parents. I think Alfred P. Dolittle expressed the attitude of my mother's parents when he sang in "My Fair Lady:"
They'll go out and start supporting you!